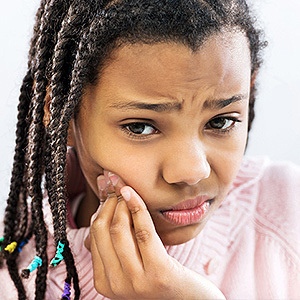 If your child has developed a cavity, you may be wondering why it needs treatment. It might seem unnecessary to treat a cavity on a tooth that will soon be replaced with a permanent one, but it's important to keep these primary teeth healthy in order to avoid premature loss or gum disease. 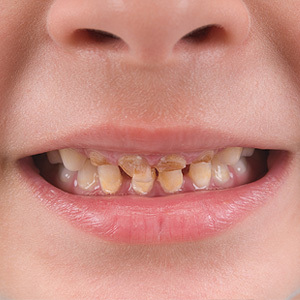 At the Children's Dental Center of New Hampshire in Amherst, Dr. Andrew Cheifetz and Dr. James McAveeney see many young patients with cavities, also known as tooth decay, and they've answered some of the important questions they hear from concerned parents. At any time, our mouths contain millions of bacterial agents. While these won't necessarily make you sick, they can cause problems for your teeth. When the carbohydrates, or sugars, in the food you eat interacts with this bacteria, it creates an acid that can break down the structure of the enamel on the outside of the teeth. While brushing and flossing breaks this cycle and keeps decay from setting in, it doesn't take long for the acid to do damage if oral hygiene isn't a habit or certain areas are overlooked. Children are at particular risk for cavities since they are drawn to sugary foods and aren't always diligent about their oral health. Most cavities will need a filling in order to remove the decay and replace the enamel with a strong, safe material like metal or porcelain. Not all fillings require anesthesia to numb the area, especially if the cavity is minor; your Amherst pediatric dentist will determine how severe the decay is and the best way to treat it. In some cases, where the decay cannot be effectively a crown will be need be fitted over the visible part of tooth until it's ready to come out on its own. Even after your child is old enough to brush their own teeth, monitor your child's brushing and flossing techniques to make sure they're doing them correctly. Your Amherst pediatric dentist can show you the best practices for keeping your child's teeth healthy. Make sure they're using a soft-bristled toothbrush that is approved by the American Dental Association and non-abrasive toothpaste. If you have any questions about the health of your child's teeth, Dr. Andrew Cheifetz and Dr. James McAveeney want to hear from you. Contact the Children's Dental Center of New Hampshire in Amherst, NH, today!